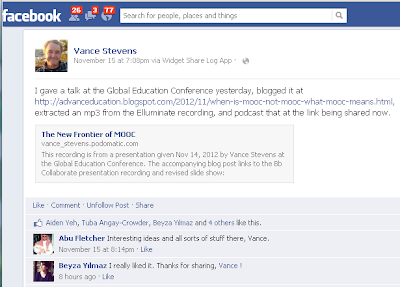 adVancEducation: When is a MOOC not a MOOC? When is a MOOC not a MOOC? I have to admit I would not be drawn to a blog post entitled so vacuously as, "what MOOC means to me" (so I thought up something catchy and made the real purpose of this post its subtitle). However, it's early days for working out what MOOC means for anyone. 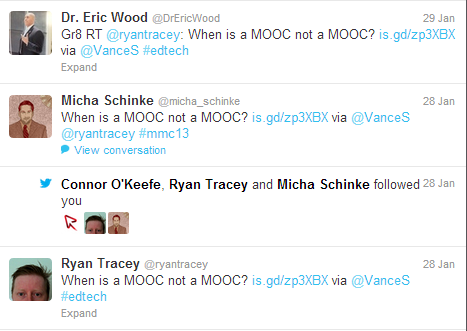 People have different ideas about what MOOC means, period. Obviously, the most relevant meaning is the one that reaches any one of us personally. MOOC means a lot to me, I'm going to try to pin down that meaning here, and maybe this will help you get your own grip on what MOOC might mean to you. There are two thrusts to the presentation. One is that an excellent audience for MOOCs might be in ESOL and language learning in general. To my knowledge, this is indeed an avenue not particularly explored or developed as MOOC, though my own online credentials stem from what might be viewed as one of many precursors to MOOCs. Dave Cormier takes credit in the "The True History of the MOOC" for invention of the term MOOC in the spring of 2008 (mp3 available, http://www.downes.ca/presentation/300). He does point out that there have been many MOOC-like configurations for learning since the 19th century, but that the term MOOC to describe them began with his inspiration, which Leigh Blackall says (in A True(er) History of Moocs http://www.leighblackall.com/2012/10/a-trueer-history-of-moocs.html), that MOOC's emergence as a meme for universities and businesses, has become 'irritating'. I have argued that we had MOOCs before 2008 as well, one example being http://study.com, which offered language lessons to all comers, and which spawned Writing for Webheads, which started leaving artifacts online in 1998 <http://prosites-vstevens.homestead.com/files/efi/webheads.htm>. So regarding what MOOC means to me, one interest I have in it is as a platform for what we were doing in 1998, when we were experimenting with platforms for teaching people ESOL and other languages for free online. It was around this time that I became aware of John Hibbs's work in the pre-MOOC era. John had created a web page from which he launched a virtual ship each year to make a journey around the world hour by hour in 24 time zones <http://www.bfranklin.edu/gld8/gld8.htm>. He had organized people in different parts of the world to manage the program for that region and in 1999 I was tapped by the Middle East organizer Neil Hynd to make a presentation of some kind. I remember that the first one I did, I was patched into the stream through a POTS phone line, but in subsequent years John was using Real Player for streaming the audio, Though our team again presented in 2001 from Abu Dhabi using a POTS phone patch, we listened via Real Player. At the time this was impressive stuff, right on the cutting edge. John was one of the first pioneers of free (that was unusual!) online seminars of educators who could meet in real time through his web pages. John's effort stimulated me to do something similar in organizing three WiAOC's (Webheads in Action Online Convergence), each one a 3-day round the clock free all-volunteer online conference that I coordinated in 2005, 2007, and 2009 <http://wiaoc.org>. Webheads in Action (WiA, http://webheads.info) came about in response to the fact that an emerging community of educators had started overwhelming the ESOL student voices in the original Writing for Webheads community. How this happened has been documented elsewhere (e.g. http://tinyurl.com/tacon2012L2g), but again as far as MOOCs are concerned, Webheads began focusing on teachers as opposed to students when it started giving EVO (Electronic Village Online, http://evosessions.pbworks.com) sessions in 2002, and the WiA community grew from there, to over a 1000 members today in just the Yahoo Group alone. Again, this is not meant to be a description of WiA or EVO, but simply to suggest that if WiA and EVO are considered to be courses, and if 1000 members is massive, then they are definitely open and online, and had we started them 6 years after we did we might have called them MOOCs. At the time we called them variously groups, communities, and networks (Stevens, 2009). Meanwhile I have been teaching a Multiliteracies course for EVO and the last couple of years I've been utilizing MOOC elements in the course at http://goodbyegutenberg.pbworks.com. It's essential for such a course to have a framework. When I started the course in 2004 I patterned that framework on Stuart Selber's aspects of functional, critical, and rhetorical multiliteracies. After attending WorldCALL in 2008 and meeting Mark Pegrum there, I divided the course into the lenses through which he viewed the topic in From Blogs to Bombs. But as I learned more about MOOCs and experienced them more and more firsthand, in 2011 I started dividing the topics of the available five weeks into those suggested in Dave Cormier's viral videos explaining the 5 steps to Success in a MOOC: orient, declare, network, cluster, and focus (this link will point you to all the videos in the series: http://youtu.be/r8avYQ5ZqM0). Now, in 2013, I have renamed the course Multiliteracies-MOOC (or multiMOOC for short) and Ana Cristina Pratas and I are going to run it even more overtly as a MOOC, as described in the proposal and rationale here: http://TinyURL.com/EVO2013MultiMOOC). In this course, the syllabus is just a suggestion (orient). Participants decide, each individually, what they want to accomplish in the course (declare). They network with one another to collaborate on shared goals, they produce what I call Me-Portfolios to reflect on how well they have accomplished their goals, and this next time around I hope to introduce some form of badging to help participants focus their goals and vis a vis their accomplishments in the course. In our last Learning2gether event, on Sunday November 11, Jonathan Finkelstein offered to help us envisage and realize that through the LearningTimes BadgeStack facility, http://learning2gether.posterous.com/jonathan-finkelstein-walks-us-through-learnin. So what is a MOOC course then? 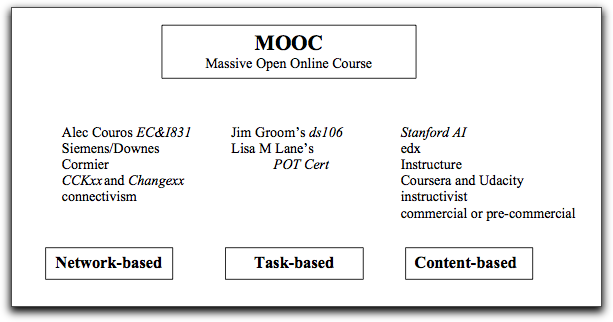 First of all I should point out there there are different kinds of MOOCs, and mine is just one of those kinds. Lisa Lane has isolated at least three strains in the wild, as shown in this graphic from her blog post here: http://lisahistory.net/wordpress/2012/08/three-kinds-of-moocs/. If the facilitator for whatever reason (too many participants, thinks it's better if s/he stands aside) gives the responsibility for sense-making to participants in a MOOC, then they might negotiate how to make sense of their syllabus with one another. This is where the massive part of MOOC kicks in. If the critical mass of participants is correct, then nuclear fission will occur in some people's brains, and they will be driven to blog and tag and comment on each other's posts, and leave reflections up as artifacts on the web. If the MOOC is run by Stephen Downes then it aggregates these posts through a script called gRSShopper <http://grsshopper.downes.ca/description.htm> and publishes them each day in a daily 'newsletter' generated from that aggregated content. If the MOOC is run by me then we have to replace the word 'massive' in its acronym with something more appropriate to the scale of the venture, say, 'minuscule' for example. In any event, this addresses the first issue of our presentation, the appropriateness of MOOCs to teaching ESOL and other languages. Also the kind of MOOC best suited to a communicative and socially-driven endeavor such as language-learning is cMOOC, based on the concept as initiated by Siemens and Downes, with Cormier's contribution of the just-so acronym. As for why anyone would want to run such a course, the Internet is full of sites already where language teachers are competing with one another to share their knowledge with students in the most clever way possible, for free. Stephen Downes was once asked why he would flog himself across the back with a course open to thousands (of course, they didn't know at the time it would attract so many :-) when he could have left it at just the two dozen enrolled in the course at the college, and he replied simply, because he would learn from it. This is the prime motivator for setting up a cMOOC. Our MOOC model emphasizes creation, creativity, autonomy, and social networked learning. The Coursera model emphasizes a more traditional learning approach through video presentations and short quizzes and testing. Put another way, cMOOCs focus on knowledge creation and generation whereas xMOOCs focus on knowledge duplication. This brings us to the second brunt of John's post, the second thrust of our presentation, and this is that MOOCs, and by this John means xMOOCs, as conceived by Coursera and Mechanical MOOC, might damage hard-earned university branding. John and I have both enrolled in such courses. I have experienced the very humanistic gentle reminders and suggestions issued by Mechanical MOOC, http://www.i-programmer.info/news/150-training-a-education/4684-mechanical-mooc-offers-introductory-python-.html, almost as if there was a human there, while John can (and will in the presentation) document very different experiences of frustration with Coursera. John's contention is that in their rush to sign on with mechanical courseware generators, universities might be weakening the quality of their offerings until the purveyors of such courses can improve their quality to the standard of instruction expected from those institutions. Though written to a different topic, Siemens's quotable "there's no there there" springs to mind from the anecdotal evidence that John reports (Siemens's quotable article: http://www.elearnspace.org/blog/2011/07/30/losing-interest-in-social-media-there-is-no-there-there/). John's is not a voice in the wilderness. Mike James in an article in I Programmer says that "the methods used by the hugely successful courses are little changed from the dark ages" http://www.i-programmer.info/professional-programmer/i-programmer/4494-massive-open-online-courses-fail-students-with-dark-age-methods.html. James refers to Sebastian Thun's co-professor in the Stanford AI course, Peter Norvig, who had made reference to the dark ages in his TED Talk on the AI MOOC, http://www.i-programmer.info/news/150-training-a-education/4398-peter-norvig-on-the-100000-student-classroom.html. But this article is about what MOOC means to me (to me it means "cMOOC"). However, the extrapolation of the MOOC concept to xMOOC is I think part of what is irritating both John Hibbs and Leigh Blackall. When Sebastian Thun took the MOOC concept to the point where he demonstrated that he could not only teach Artificial Intelligence in a MOOC, and scale that to thousands of comers, AND assess and evaluate those participants through algorithms developed by Amazon, the proof of concept he had shown was xMOOC. Thun proved the concept so well that he decided his tenured position at Stanford was beneath him and left there to work for Google and ended up with his own xMOOC, Udacity, (http://www.guardian.co.uk/education/2012/nov/11/online-free-learning-end-of-university). Thun is fully convinced that he made the right move, and he might be recognized as a visionary for it, and like Stephen Downes he will surely learn from the experience, but the motivation for this effort is more toward the flip side of education from that of cMOOC. Whereas one obvious limitation of cMOOC is that participants need to be highly motivated self-starters who are driven to learn about a particular topic, xMOOC is addressed more at the masses, the hoards of students for whom expensive Ivy League education (or increasingly, even community college education) is less and less an option. Candace Thille, director of the OLI at Carnegie Mellon University, worries that this development might lead to a "bifurcation" in educational opportunities in the not-that-distant future, http://www.insidehighered.com/news/2012/05/10/candace-thille-talks-moocs-and-machine-learning. Given the downward spiral in the world's economies and shortage of resources, abundance is a word more and more applied to knowledge resources than to natural and manufactured ones, which are approaching scarcity. Where the ascendancy of knowledge abundance intersects with the increasing lack of natural and economic resources, xMOOCs may well be the most viable path of quality education for learners of the future. John's point has to do with the present state of the quality of THAT instruction, and how that might impact branding of universities associated with the current xMOOC players. So as not to get off on a semantic battle, technically, a MOOC is a MOOC if it has lots of participants, if it's open to anyone, which means for free (otherwise it wouldn't be open), if it's online, and if it's a course. All of the sites mentioned in this post are MOOCs in that broad definition. So my conclusion applies to the spirit of MOOC, what I in my heart of hearts feel is MOOC in its pure form. If I were to conceive of a diagram giving the whole spectrum of MOOC from the 19th century (as Cormier mentions) up through the 20th (with http://study.com and Writing for Webheads) and into the turn of the century (where for example EVO started teaching open courses massively online) - then I would put those early efforts off to the left and place cMOOC as conceived in 2008 squarely in the center, with the current evolution of xMOOCs veering off to the right and into the future. I would say that open online courses we used to organize and try to scale massively predated a window of opportunity for social networking and aggregation of content that the cMOOCs slotted nicely into. And I would say that these early efforts depart from what I think of as truly MOOC about as equally as do the later renditions, which though technically massive, open, online, and courses lack a lot of the flavor of the middle-cMOOCs by virtue of not having well developed the connectivist aspects of the 2008 model. 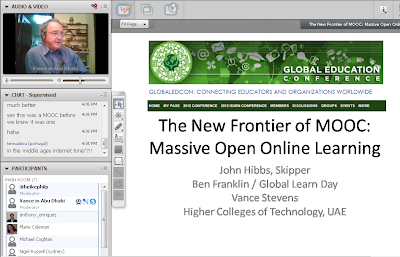 MOOCs in the future: A return to center? The sketch began with MOOCs in the middle and with the entities at the end of each line setting up free open online courses but monetizing some aspect in the form of accreditation, help facilities, etc. The circle around MOOC indicates that MOOCs utilize OER (open education resources) and the "open web of content" as illustrated in the diagram Stephen inserted and then relegated to the top left corner. 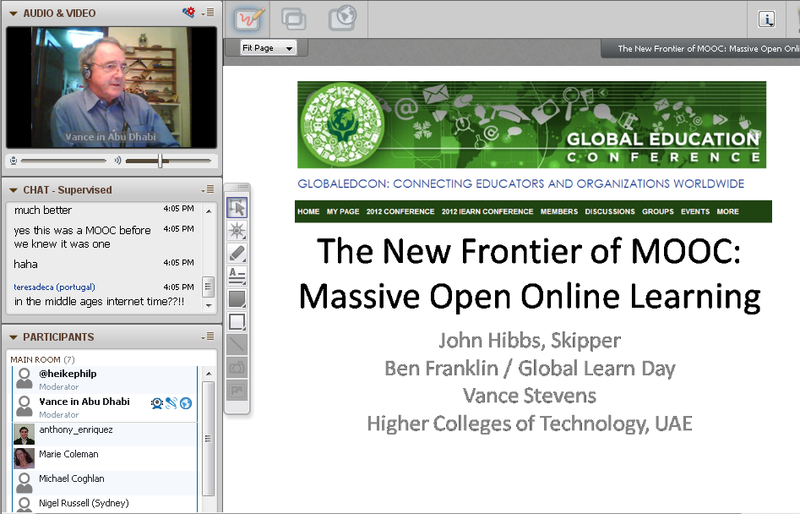 Then Steve Hargadon asked in the discussion if these entities (the new xMOOCs) were paying tribute to their roots in cMOOC. Stephen said off the top of his head, "no" but did note that in something he had come across lately, it was found that the biggest predictor of success at Harvard (apart from getting into Harvard) was participation in study groups. As others commented, Stephen proceeded to wipe the MOOC from the center of his diagram and put in xMOOC with study groups forming around any given xMOOC. Blackall, Leigh. (2012). A true(er) history of MOOCs. Open and Networked Learning. Retrieved on November 15, 2012 from http://www.leighblackall.com/2012/10/a-trueer-history-of-moocs.html. Downes, Stephen. (2012). A true history of the MOOC. Stephen's Web. Retrieved on November 15, 2012 from http://www.downes.ca/presentation/300. Hargadon, Steve. (2012). Tonight - A true history of the MOOC. Education, technology, social media, and you! 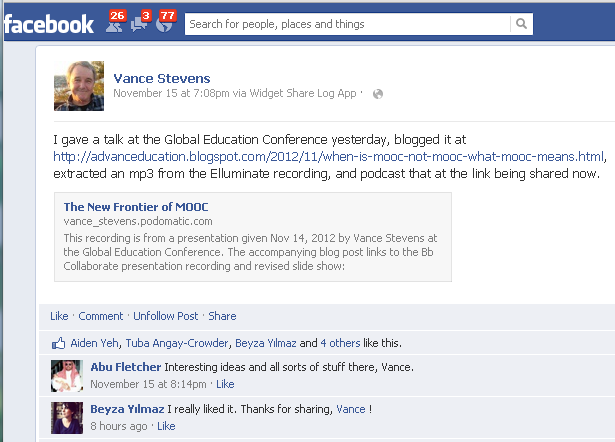 Retrieved on November 15, 2012 from http://www.stevehargadon.com/2012/09/tonight-true-history-of-mooc.html. Hibbs, John. (2012). MOOCs For Credit – Coursera & Antioch. Ben Franklin. Retrieved on November 15, 2012 from http://oregonhibbs.com/2012/10/30/moocs-for-credit-coursera-antioch/. Hibbs, John. (2012). Global conference Hibbs prepared remarks. Ben Franklin. Retrieved on November 15, 2012 from http://oregonhibbs.com/2012/11/14/global-conference-hibbs-prepared-remarks/#more-682. James, Mike. (2012). MOOCs Fail Students With Dark Age Methods. I Programmer. Retrieved on November 15, 2012 from http://www.i-programmer.info/professional-programmer/i-programmer/4494-massive-open-online-courses-fail-students-with-dark-age-methods.html. James, Mike. (2012). Peter Norvig On The 100,000-Student Classroom. I Programmer. Retrieved on November 15, 2012 from http://www.i-programmer.info/news/150-training-a-education/4398-peter-norvig-on-the-100000-student-classroom.html. Kolowich, Steve. (2012). MOOCs and Machines. Inside Higher Ed. Retrieved on November 15, 2012 from http://www.insidehighered.com/news/2012/05/10/candace-thille-talks-moocs-and-machine-learning. Lane, Lisa. (2012). Lisa's (Online) Teaching Blog. Retrieved on November 15, 2012 from http://lisahistory.net/wordpress/2012/08/three-kinds-of-moocs/. Pegrum, Mark. (2009). From Blogs to Bombs: The Future of Digital Technologies in Education. UWA Publishing, Crawley, Western Australia. Selber, Stuart. (2004). Multiliteracies for a digital age. Carbondale: Southern Illinois University Press. Stevens, Vance. (2009). Modeling Social Media in Groups, Communities, and Networks. TESL-EJ, Volume 13, Number 3: http://www.tesl-ej.org/wordpress/past-issues/volume13/ej51/ej51int/. Stevens, Vance. (forthcoming). Learning2gether: Wiki-based worldwide teacher professional development Paper presented at the annual TESOL Arabia conference in Dubai, March 9, 2012. Submitted for publication in the proceeds. Version available online: http://tinyurl.com/tacon2012L2g. Still nobody will know what the MOOC is . There is no such thing called MOOC. It is a cMOOC by Stephen only in 2008 . period . Today there are vendors( They are elite universities too ) rpviding online courses at very small fee. Therefore they attract many thousands people. I suggest colleges should get from these vendors those very valuable online courses and offer them to their 18 million students. Then reduce the cost + increase the quality of the college . Tnanks, Vance, for a good aggregation post. I was trying to collect and review everything. Now that there is so much of, I'm leaving more in the reader and tagging/bookmarking just the best overview/about posts. I'll be adding this one to it. Thank you for remembering StudyCom. As an aside, a student from my very first StudyCom class turned up in Hybrid Pedagogy's MoocMooc, reminded the others about us early adopters. That was a treat. How do you like this blog? Who else likes this blog? Prensky on Interactive Whiteboards, should teachers be 'allowed' to use them? How long will Facebook last?